Fried chicken and donuts: a fine match. : Fried chicken, donuts and coffee: that’s what chef Michael Solomonov (Zahav) and his team turn out at Federal Donuts in South Philly. 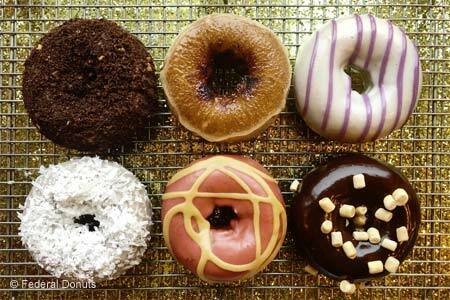 "Hot Fresh" donuts include a strawberry-lavender and cinnamon brown sugar, while "Fancy" varieties feature such tantalizing combos as Crispy Nutella, Strawberry Milkshake and Blueberry Pancake. The Korean-style twice-fried chicken comes in two rubs (za’atar coconut curry and buttermilk ranch) and three glazes (chili-garlic, sweet-soy garlic and honey-ginger). Chicken is also served until there’s no more to be had, and folks arrive early to get numbers and then wait until the birds drop. However, additional locations in Center City, North Philly, West Philly and at Citizen's Bank Park (home of the Phillies) have made it easier to sample these tasty treats before they fly out the door.